The Guacamelee! 2 Nintendo Switch edition is out for some rasslin' fun today. Looking for something colorful and addictive to play on your Switch over the impending holiday season? If you're Smashed out already, try Guacamelee! 2, which is now available on Nintendo Switch as of today. Players can take on the role of luchador Juan Aguacate as he punches, kicks, and grapples with a series of enemies in the Metroidvania-styled adventure. Juan is now married to El Presidente's daughter, Lupita, and they have two children of their own. Juan has grown out of shape, but that doesn't stop new bad guys from coming to town to threaten the whole of the "Mexiverse." Juan has to travel through a portal to "The Darkest Timeline" to find out where the trouble is coming from, where he and Lupita have bee killed by the enemy named Calaca, where another luchado named Salvador took over in his stead. Salvador, however, has become corrupt in the time since, and so Juan must work against Salvador so he can no longer collect the relics he needs to take over the Sacred Guacamole and rule the world. You can also snag Guacamelee! 2's first DLC pack, Three Enemies, today fo $2.99. Keep an eye out for the second DLC pack, Proving Grounds, when it drops next week on December 17th in the eShop. 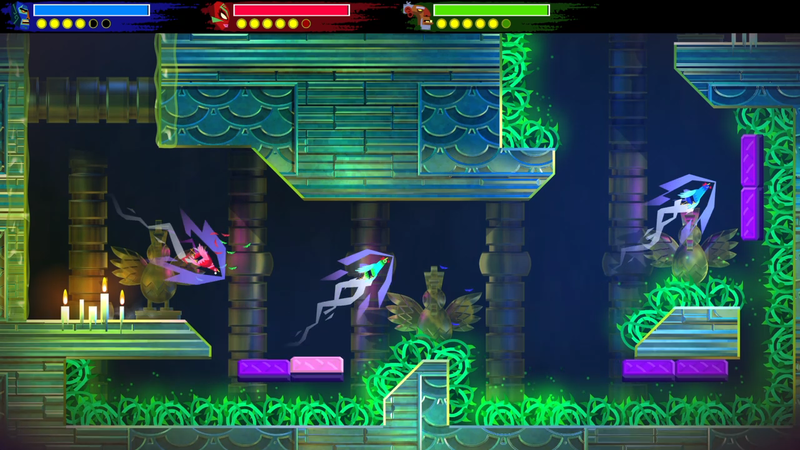 "Drinkbox Studios didn't set out to reinvent the wheel with Guacamelee 2, but rather built further on the original's formula and crafted a new story around it. Fortunately, that original formula is still wildly fun, with fluid combat, a vast world to explore (with numerous fast travel points), and secrets hidden all around. All of it is wrapped around a hilarious story that never takes itself too seriously, but does offer up some sincere heartfelt moments to balance itself out." Check it out for yourself and see if it rustles your jimmies properly!